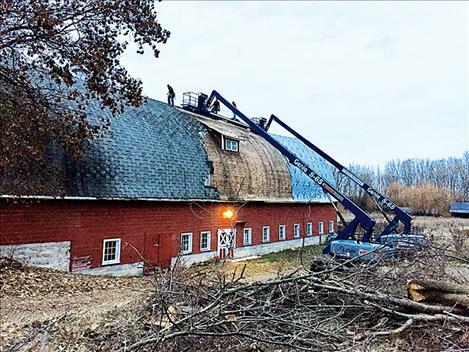 The Red Barn in St. Ignatius gets a new roof. ST. IGNATIUS – Actors, brides, dancers, dairy cows and cattle are among the many who have used the huge barn across from the St. Ignatius Mission church since it was built in the 1930s. The two-story building has a rich history in the area, but it has been unusable in recent years. Now, the barn is getting a new lease on life with the renovations on the 12,000 square foot roof. In the 1930s when Jesuits came to the Mission Valley, they built the barn to house their dairy operation. Years later, the Jesuits shut down their dairy and the Brown family bought the building and used it to raise cattle. In 1993, the Tingey family bought the building. They raised livestock on the lower floor of the barn and held events on the top floor. Rita Tingey, who has a degree in performing arts, directed rehearsals and performances by the Purple Mountain Players in the barn. The community used the space for summer camps, funerals and bazaars. But recently, the roof has leaked so badly that the barn is unusable except in the most ideal weather conditions. In 2011, Tingey decided that she wanted members of the community to be able to use the barn again, so she started saving money. Over seven years, Tingey saved the money to finance the $65,000 roofing project herself. She hopes that revenue from future events will offset some of that cost. She hired Miller construction to fix the roof. According to Tingey, the roof will be finished in the next two weeks if weather permits. Tingey is already dreaming of the events that will happen under the barn’s roof. Her son, Tyler Arlint, is going to spend the summer planning a haunted “Barn of the Dread,” complete with a spooky tour of the barn and a pumpkin patch. The event premiers next fall. Tingey plans to resume directing community theater productions in the barn and renting it out to people for private events. According to Tingey, the community response has been positive. People who acted in her plays before the roof fell into disrepair have been asking when they can get back on the stage with her. She says she looks forward to working with a new generation of young people through theater. “There are a lot of people who grew up doing plays in that barn and they have kids now. They’ve been asking if I’ll do more,” she said. Tingey is committed to restoring the barn as a resource for the St. Ignatius community. “I feel that it’s my stewardship to build this community up,” she said. Tingey said the barn is starting to feel like a viable place for community to gather again. Renovations are still underway, but water is no longer dripping onto the barn floor. “We’re singing and dancing; we’re so thankful,” Tingey said. And soon, the barn will be full of others singing and dancing too.